The Pathways students attended the 2nd Annual Special Kids Rodeo at the Roots 'N Boots Queen Creek. The event was at the Horseshoe Park & Equestrian Center. The student participated in many rodeo activities that included learning to rope, brushing & grooming, feed & tack, and a stick horse race. Each student received a gift back pack with the awards they earned at each of the eight rodeo stations. All students received their own cowboy hat, t-shirt and medal as well. The students and staff had a wonderful time and we look forward to next year's event! Polygons are running wild in 2nd grade! Mrs. Graham’s kiddos are having a blast describing and comparing polygons. Our class had been learning about the Inca, Aztec, and Mayan people. To wrap up our standards, the class created suns - something each people worshipped for power and prosperity. Students each needed a Styrofoam disk, glitter glue, aluminum foil, and construction paper. The project was a huge success and took a week to create. They currently are hanging in our hallway. Thank you to parents who helped with supplies for the project. Check out what 5th Grade has been doing this year so far. Click on the link below. 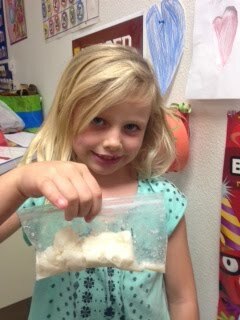 Mrs. Dennison's class made mini water cycles to test to see how the water cycle actually works. The project lasted three days with exciting results! Special "THANK YOU" to Safeway for donating the containers for our class to use. 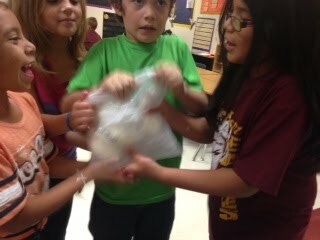 Mrs. Mullin's class experimenting with dry ice! Will the balloon float on the ice or on the gas or possibly both? The balloon only floated on the water. Nick Saathoff is a Harvard student athlete and former student of Mr. Contreras. He was in town visiting before starting his senior year of baseball and academics for the Harvard Crimson. Before heading back he was kind enough to make a stop by Anthem K-8 and speak to our seventh and eighth graders in Mr. Smith’s Social Studies classes about the importance of academics and athletics in school. Mr. Smith’s students were a real engaging group with great questions for Mr. Saathoff about setting high goals both in the classroom and in whatever club, sport or activity they do. Mr. Contreras would like to send a big thank you to Mr. Smith for inviting Nick into his classroom, and Mr. Saathoff for finding time in his busy schedule for our students. Our new students have their first friends introduce them around to all the staff. Mrs. Candelaria's 2nd Grade class is accelerating their reading skills with AR. In Science, we are studying the specific animal structures of a mealworm. The students did their own research on their tablets. During centers, students meet on the rug with their reading mentor to read with them. Caring, Respect, Trustworthiness, Fairness, Responsibility and Citizenship! Thank you to our Florence Fire Department for coming to our Pre-school class for Career Day! Pathway Students using their Chromebooks to learn! Who says reteach can't be fun? Second graders at Anthem make Even & Odd Numbers posters during reteach & enrich. Mrs. Mullin's Class using Mobymax and Google for Sentence Writing. Mrs. Graham's 2nd Grade Class is fired up about reading! 3 of her students have already achieved their quarterly AR Reader goals! Congratulations to Barrett Roemmich, Hudson Graves and Madyson Filley! Go Eagles! 7th & 8th Grade Reading and Social Studies Students working hard, collaborating and using Chromebooks in class. Students read the novel The Tiger Rising by Kate DiCamillo for the last two weeks. This novel covered many of the standards for the first benchmark. The students reviewed plot, setting, major vs. minor characters, symbolism, along with learning to work collaboratively in their groups. The students enjoyed the book and the project that went along with it (creating a large plot diagram). Our 1st grade through 8th grade students had the opportunity today to get wet from our Florence Fire Department who came out and sprayed our students with the fire hose to cool them down. What a great way to end the week! Thank you to our community fire fighters for giving our students such a great treat today! What a great night! We had 90% parent attendance, there was excitement in the air for our parents and students. A big shout out to our PTA for inviting the Florence Police Department to roll fingerprints for free for all our volunteers. We had over 80 volunteers sign up that night. We are very happy to see our parents, teachers and students coming together for the 2014-2015 school year. Go Eagles! The Anthem staff has been meeting this week to get ready for an exciting new year. We had a great time last night at the "Meet the Teacher Night" and are excited to see even more students and parents tonight. Our first day of school is on Monday, July 21st. This is going to be a great and exciting year with an amazing, motivated and wonderful staff. Go Eagles!